Many service events require you to raise the car and work under it. If you don’t have a hoist or lift you can accomplish the same thing using 4 jack stands and a 2 ton trolley jack. In a previous post I’ve explained the process of jacking a single point of the car. Please follow the same preparation steps before beginning to lift the car. If you plan to remove the road wheels once the car is in the air, I’d suggest you check out my previous post on this as well. 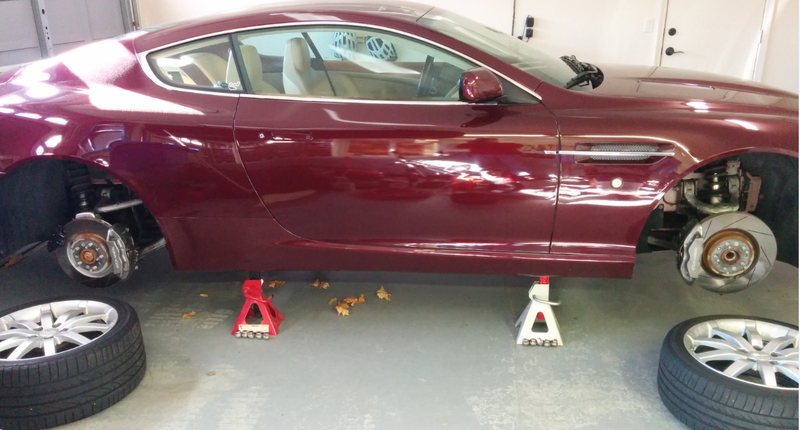 In this post I will cover a few additional tips on raising the entire car safely and placing on stands. 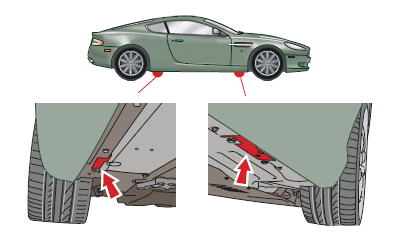 Aston Martin warns us in both our Owner’s manual and the full Workshop Service Manual to only lift the car at the four jacking points (and NOT the lower suspension arms). It also exclaims the only place suitable for the jack stands is at the same four jacking points. Do you see the conundrum? Hey Aston – how the hell are we supposed to do this if the jack and the jack stand has to share the same location?! My solution was to place the jack just rearward of the front jacking points, on the same box beam that runs the length of the car from the front to rear jacking points. I cut a small piece of wood about 6” long and used it between the jack and the car. I placed a few layers of blue painters tape on the plastic underbody where the wood will make contact (to prevent scratching and help line up the wood). The position is right between the two T30 screws. The car is so rigid and has perfect weight balance, so when I jacked at this location, the entire side of the car was raised allowing you to place both the front and rear stands at the same time. I set my jack stands for about 14” of clearance. This provides me enough room to slide around under the car and work effectively. You may also be interested in the couple of tips I discuss in my post on How to Lower Your Car Off Jack Stands. So very grateful that you have taken the time to build this brilliant site. It’s full of the useful stuff an average DIYer needs to be able to tackle routine maintenance that you would have to visit your dealer for at great expense. It’s really fun to do this important work yourself too and gives owners the confidence to perform the basic tasks we all used to enjoy when the technology was much simpler. Well done Steve AMOC should be embracing your idea for their other marques and I will be writing to them praising your initiative and asking them when it will be available within the membership subscription. Thanks for the Kudo’s Steve. Curious, did the Astons on the Web article come out in the latest quarterly? I’m in the US so we are being the curve on delivery. Hey Steve, check out the Rennstand by Safejack. They have a YouTube of it being demonstrated. Really cool idea. Immediately thought of us Aston owners and how difficult it is to jack the car up and support on stands in virtually the same spot on these cars. This product does a great job , check it out.